Click the button below to add the 2018 Kia Stinger Borla S-Type Catback Exhaust to your wish list. BORLA Type-S / Type-S II Cat-Back & Rear Section exhaust systems feature patented straight-through and multi-core technology to unleash hidden horsepower. Increased exhaust velocity adds power, driving excitement, fuel economy, and a distinctive more aggressive sounding ''S-Type'' sound - respected by motoring enthusiasts everywhere. 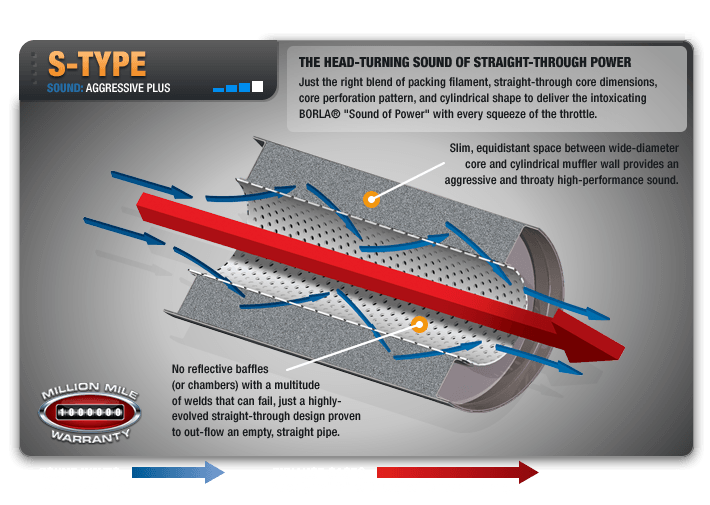 From the design characteristics of the inner cores to the amount of sound-absorbing composite filament, all specifications of Borla exhaust systems are tuned on a vehicle-by-vehicle basis for an optimum blend of performance and sound. Each system is built from premium 300-series austenitic stainless steel, superior to T-400 series knockoffs (such as 409), to give you the absolute best in performance and durability. Ultra-smooth mandrel bends ensure maximum flow & power, and precision computer-controlled CNC manufacturing ensures an accurate fit. Best of all, BORLA stands behind every system with a Million-Mile Warranty. Just what you'd expect from the world's most experienced (and most winning) exhaust brand.